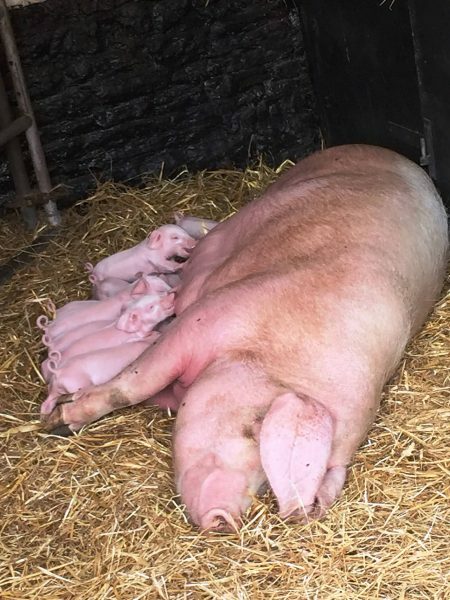 A litter of rare breed piglets has been born at Sacrewell near Peterborough. Staff at Sacrewell watched in awe as the 10 piglets arrived on Saturday, 4 July to sow Maggie, who is on loan from the Goosetree Herd in Coates, Cambs. Marketing executive Megan Allen said: “It a particularly happy moment as our own sow, Ada, failed to conceive earlier this year. British Lop pigs are one of the rarest breeds of native pig in the country, having lost popularity in the 1940s when food production trends ensured all breeds were stable and efficient. The quicker they were the breed and grow, the better and the British Lop did not cut the mustard. Today, their numbers are at their greatest since but they are still classed as vulnerable by the Rare Breed Survival Trust. The 10 piglets will remain at the farm throughout the summer with their mother, Maggie, so that visitors to the centre can see them grow.